Mona C. Löffler, Alexander E. Mayer, Jonathan Trujillo Viera, Angel Loza Valdes, Rabih El‐Merahbi, Carsten P. Ade, Till Karwen, Werner Schmitz, Anja Slotta, Manuela Erk, Sudha Janaki‐Raman, Nuria Matesanz, Jorge L. Torres, Miguel Marcos, Guadalupe Sabio, Martin Eilers, Almut Schulze, Grzegorz Sumara. Nutrient overload in combination with decreased energy dissipation promotes obesity and diabetes. Obesity results in a hormonal imbalance, which among others activates G protein‐coupled receptors utilizing diacylglycerol (DAG) as secondary messenger. 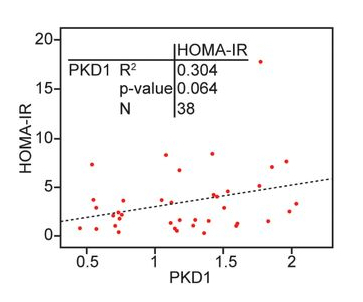 Protein kinase D1 (PKD1) is a DAG effector, which integrates multiple nutritional and hormonal inputs, but its physiological role in adipocytes is unknown. 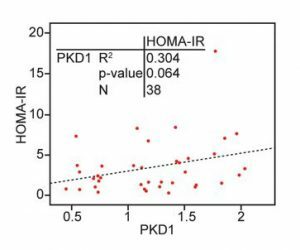 Correlation between PKD1 expression and HOMA‐IR levels in human sWAT (Image: Nuria Matesanz). Here, we show that PKD1 promotes lipogenesis and suppresses mitochondrial fragmentation, biogenesis, respiration, and energy dissipation in an AMP‐activated protein kinase (AMPK)‐dependent manner. Moreover, mice lacking PKD1 in adipocytes are resistant to diet‐induced obesity due to elevated energy expenditure. Beiging of adipocytes promotes energy expenditure and counteracts obesity. Consistently, deletion of PKD1 promotes expression of the β3‐adrenergic receptor (ADRB3) in a CCAAT/enhancer binding protein (C/EBP)‐α‐ and δ‐dependent manner, which leads to the elevated expression of beige markers in adipocytes and subcutaneous adipose tissue. 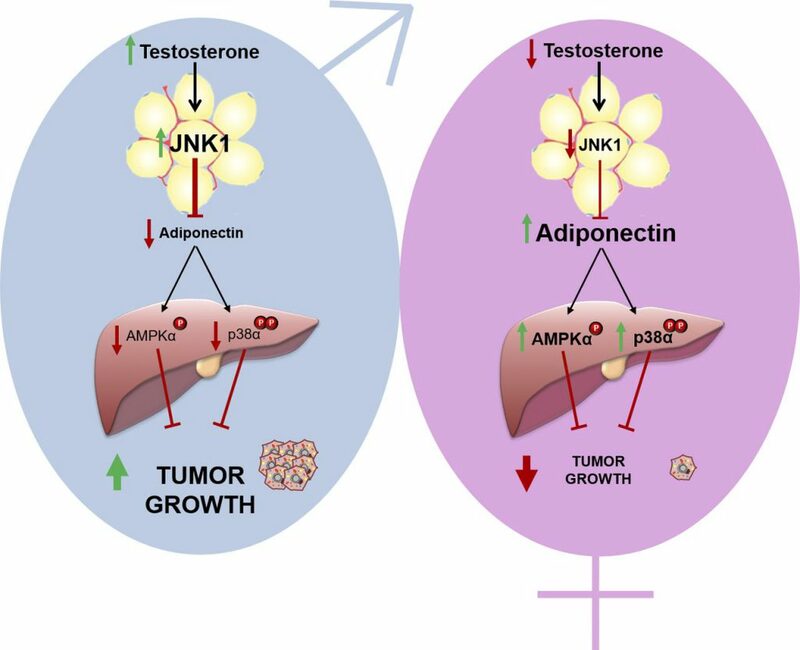 Finally, deletion of PKD1 in adipocytes improves insulin sensitivity and ameliorates liver steatosis. Our results showed that p38δ is activated in BAT by cold exposure, and lack of this kinase specifically in adipose tissue (p38δFab-KO) resulted in overweight together with reduced energy expenditure and lower body and skin surface temperature in the BAT region. These observations indicate that p38α probably blocks BAT thermogenesis through p38δ inhibition. Consistent with the results obtained in animals, p38α was reduced in visceral and subcutaneous adipose tissue of subjects with obesity and was inversely correlated with body mass index (BMI). Thus, depletion of PKD1 in adipocytes increases energy dissipation by several complementary mechanisms and might represent an attractive strategy to treat obesity and its related complications. Noelia Martínez-Sánchez, Patricia Seoane-Collazo, Cristina Contreras, Luis Varela, Joan Villarroya, Eva Rial-Pensado, Xabier Buqué, Igor Aurrekoetxea, Teresa C. Delgado, Rafael Vázquez-Martínez, Ismael González-García, Juan Roa, Andrew J. Whittle, Beatriz Gomez-Santos, Vidya Velagapudi, Y.C. Loraine Tung, Donald A. Morgan, Peter J. Voshol, Pablo B. Martínez de Morentin, Tania López-González, Laura Liñares-Pose, Francisco Gonzalez, Krishna Chatterjee, Tomás Sobrino, Gema Medina-Gómez, Roger J. Davis, Núria Casals, Matej Orešič, Anthony P. Coll, Antonio Vidal-Puig, Jens Mittag, Manuel Tena-Sempere, María M. Malagón, Carlos Diéguez, María Luz Martínez-Chantar, Patricia Aspichueta, Kamal Rahmouni, Rubén Nogueiras, Guadalupe Sabio, Francesc Villarroya & Miguel López. Thyroid hormones (THs) act in the brain to modulate energy balance. We show that central triiodothyronine (T3) regulates de novo lipogenesis in liver and lipid oxidation in brown adipose tissue (BAT) through the parasympathetic (PSNS) and sympathetic nervous system (SNS), respectively. Central T3 promotes hepatic lipogenesis with parallel stimulation of the thermogenic program in BAT. The action of T3 depends on AMP-activated protein kinase (AMPK)-induced regulation of two signaling pathways in the ventromedial nucleus of the hypothalamus (VMH): decreased ceramide-induced endoplasmic reticulum (ER) stress, which promotes BAT thermogenesis, and increased c-Jun N-terminal kinase (JNK) activation, which controls hepatic lipid metabolism. 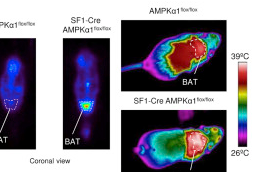 Of note, ablation of AMPKα1 in steroidogenic factor 1 (SF1) neurons of the VMH fully recapitulated the effect of central T3, pointing to this population in mediating the effect of central THs on metabolism. Overall, these findings uncover the underlying pathways through which central T3 modulates peripheral metabolism.